Get The Word Out About Your Business With Postcards! The holiday season is right around the corner and with that many things are going on. Churches are holding special services for their congregations. Retail stores are arranging their promotions. Even hospitals and clinics are holding flu shot clinics. This time of year is extremely busy and hectic, and with all of these amazing events going on, many forget to market. What good is an event without anyone showing up? Paper and Plastic Postcard mailers may be the cheapest, most fun mail item a person gets in the mail. Letting your target audience know to visit you will make your project successful, and in some cases very profitable. Depending on your budget, and goals, will help you determine whether to go with a paper postcard or the plastic version. Paper postcards are the most economical, fast way to get the word out. Many paper postcards come in very thick materials with a coating, making them withstand the mail environment and arrive as beautifully as they were coming off the printing press. Choosing a glossy coating also enhances the likelihood of the postcard getting read and not simply tossed in the trash. Paper postcards generally have very fast production times, so you can rely on a mailing to reach your customers within a few short days. If you have the budget, a plastic postcard is the best choice for many reasons. First, they are made of plastic, so they are have a higher chance of being read. Also, they can have a plastic card built right into the postcard, making them interactive and fun; not to mention a lasting souvenir of your business. There are also some postcard mailers that allow you to put a magnetic strip on the back, making them a functional card for promotions and discounts. The downside is cost and time. Plastic postcards do cost more than their paper counterpart; however, because they produce a higher read rate, you may get more sales or response making the cost worth it. Production times are much higher with plastic postcards, and can run as high as 7 to 10 days, so that is something to consider when planning your event. Businesses cannot go wrong with either postcard version. Knowing your budget, timeframe and what you want to convey to your audience, will ensure your project will be a success. Businesses struggle every day trying to find the right marketing strategy to bring customers in the door and not cost a fortune. Mailings have been a tried and true method; however, with the online marketing and email coming into play, several businesses have gone online as opposed to using traditional methods, such as mailings to increase business. Now that this shift has occurred, most consumers need something that will really grab attention in order to look twice at a mail piece. One product that gets seriously overlooked is Pressure Seal and U-Seal™. Pressure Seal mailings are traditionally used for more official functions such as pin numbers, grade card reports, bill statements or confidential results. U-Seal™ is used the same way as Pressure Seal only they are primarily for items that do not require strict confidentiality; such as utility bills. This is why using pressure seal/u-seal for marketing is a stroke of marketing genius. The less you put on the front of the sealed piece, the more inclined a consumer is to open just because they do not want to miss an important piece of mail. Right from the start you have their attention. Although Z-Fold is the most common choice of fold, many businesses are using a C-Fold version of these forms because you can design the form in such a way that when the customer perfs off the edges, it will actually leave a coupon that slips out. The other nice thing about Pressure Seal or U-Seal™ is you can run them through your laser printer, so printing is very easy and affordable. U-Seal™ only needs 10 lbs of pressure to seal. That means all you need to do is hand-seal the form. This is cheaper than going the pressure seal route. Press Seal does require a machine to fold and seal the mailer before you can send them out. This makes Pressure Seal a much more secure document and can withstand the beating it may get in the mail system. Unless you are already using pressure seal, or plan on moving other forms over to pressure seal, a U-Seal™ mailing is the one to choose. Regardless which form you choose, when marketing with mailers, any way to get customers to look twice and not throw the piece in the trash is a good thing. The more interactive a piece, the more attention it gets. It is worth a try if you have never marketed this way before, and you may be surprised on the ROI of this unique mailer. Many businesses are getting discouraged about acquiring new customers. In this economy, trying to get new business in the door is quite a challenge. With email marketing in full force, many companies believe that with a great email campaign that they will get customers without shelling out the money to do a traditional mailing campaign. This strategy works for some businesses, but for others email marketing, for a myriad of reasons, does not get the response rate a business needs to grow. The email gets caught in a spam filter, or the customer simply deletes it all together. So what is a company to do in order to get customers in the door? Many are now trying a plastic postcard mailer. Plastic postcard mailers are a new, fun way to get customers interested in whatever you are offering. Because of the many different options on a plastic card mailer, you can make them as interactive with the customer as you choose. You can create a mailer with a punch out card for the customer to bring in or store in their wallet, or keep it more simple. Because of variable imaging technology, it is even possible to customize the image, or message, on the plastic postcard mailer based on the customer name. This allows you to have a design specific to a customer for a truly unique piece just for them. For example, if you know one customer loves yellow roses and another red roses, you can make sure that those customers get a specific flower on their mailer, automatically engaging them. Cost is the main factor, normally, when choosing to undertake a plastic postcard mailing. They do indeed cost more than just a paper postcard, and definitely more if you decide to do an email blast. However, the rewards do make it worth the risk. On average, the ROI of a plastic mailer can range anywhere from 4-10% more than its paper counterparts. Paper postcards have become so common, that they are easily looked over and put in the trash. Plastic postcards seem to engage people because they stand out. Their material feels like the thickness of a credit card, and they may have the option to punch out a card which increases the interaction that much more, making the consumer look twice before they toss it out. You can print full color on one, or both, sides making them very appealing to the eye. Any industry can take advantage of a plastic postcard mailer. From car dealerships, clothing stores, restaurants, to spas, medical clinics and insurance agencies, there really is not anyone who can’t benefit from these mailers. If you want to get create a mailer and still cut costs, simply don’t mail them. Hand them out in gift bags, trade shows, your local buyers guide or right in your store. The possibilities are endless! Selecting business envelopes seems like a easy thing to do. Put a logo on an envelopes template and you are ready. Unfortunately, it isn’t always that simple. Putting together a good corporate image takes thought, vision and consistency. Your stationary is a direct reflection of your business. It should function as you need it, giving your customers the feeling of security and still be within your budget. Envelope printing seems like a pretty easy thing to understand; however, there are many different features that a business needs to consider when choosing the perfect envelopes for their business. First variable to consider is the size, or sizes, your company will need. A #10 envelope is pretty standard for most businesses. However, some would rather have a #10 with a window. And even one step further, many businesses that need payments or correspondence mailed back, need a #9 envelope with or without an envelope. From very large to extremely small, there is a huge variety to choose from. The key it to choose envelope sizes that you actually need with having a stockroom full of extra inventory. Another factor to consider is color. Color can really affect pricing on your envelope printing project. Businesses can go very simple with a one or two color option, or a full color envelope. Full color envelopes can be quite pricey and if it isn’t necessary for your corporate image, then it is more cost effective to go simple. However, if you have photo images, or a very complex colored logo, then definitely stay with full color. Trying to change your corporate image on a few marketing pieces to save money will hurt you in the long run, not to mention making your business look disjointed. There are also a large number of materials in the envelope printing world. 24# Linens, Bonds, and Classic Laid materials are just a few. Normally choosing your color helps determine what material to go with. If you choose a full color envelope, the number of materials usually is limited to one or two options. Going with a black only, or one and two spot colors, gives you the most options. Laid materials have a slight handmade finish, whereas Linen has a woven pattern. Bond material is normally smooth. There really is a material to match any look a business is going for. The best way to help determine which envelope options are best for your business is to request envelope samples from your printing company. Testing different colors and materials is the best way to see which one works for your business image. Sometimes it is best to order a small quantity with your logo and information to make sure they are how you envisioned, and then order a larger quantity when you are sure they are exactly what you want. It is better to be out a little money than a lot. Plastic postcard mailers are a great way to get the attention of current and potential customers by sending them something that they don’t normally receive. Additionally, the sturdiness of the plastic postcards will entice many recipients to interact with the mail piece, which increases the ROI supstancially compared to a paper postcard. Loyalty card– customer can gain points that are redeemable for rewards or exclusive discounts. Gift card– giving customers a $5 or $10 gift card can give them the push they need to go into the business, thus possibly either purchasing more or returning at a later date. Business card– a sturdy business card for a professional that could be used often or for a long period of time (such as a real estate agent or an exterminator) can also be a great way for customers to keep a business on their mind when they need it. These are just some of the examples when it would be beneficial to utilize plastic card mailers that include perforated cards and key tags. However, not all plastic mailers need to have these types of features. Your business can choose as many bells and whistles as it wants. The choices are limitless. Custom shipping labels come in a variety of sizes, shapes, and even colors for the wide variety of uses that a business may need. It is important to make sure that the custom mailing labels being ordered are the best size and have the right features for the shipping facility or warehouse that will be using them. For instance, if a shipping warehouse only uses one size of box, then it makes sense to only get the one size of custom shipping labels (such as fold under labels) that will fit properly on the box. However, if a business ships their products or orders in a wide variety of sizes of boxes or packaging, then different-sized labels need to be ordered. Having the right size for boxes that are processed at shipping facilities do more than just “look right”. They also help cut down on processing times (employees and/or machines don’t have to force a label to fit or apply it perfectly so it doesn’t fall off) and may eventually cut down on costs because small labels may be a lesser cost, therefore reducing large inventory and waste. Ordering the custom shipping labels for a shipping facility has several steps, the first being measuring the dimensions of all the boxes used and then comparing them to the available custom mailing label sizes. Next, shipping and processing numbers need to be reviewed– how many labels need to be ordered initially to make sure that a warehouse stays in-stock for a pre-determined amount of time? Once these figures are ironed out, it’s time to order the labels. Many online printing service companies will require a minimum order, so that needs to be accounted for, as well as how many labels are in each box and the overall cost of the labels. Comparing prices will ensure that a company gets the best deal. Do Those New Plastic Postcard Mailers Really Get Noticed By Customers? In a word, YES!!! Our customers at My1Stop.com absolutely rave about the results they get from plastic card mailings. 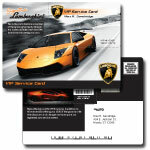 In fact, our plastic postcard offering is one of our fastest growing products. Plastic postcards stand out. They stand out because they are different than what most people have been getting in mail boxes since, well, since mailboxes were invented. Over the years, response rates to direct mail envelopes and traditional postcards have tumbled to something below 1 to 3 percent. Recipients have been conditioned to almost involuntarily throw old school direct pieces right into the trash; but plastic card products look different, feel different and most importantly provide an interactive “offer” that consumers react to, instinctively. So, yeah, your plastic postcard mailer will be noticed in most mailboxes. If you’re thinking about testing or expanding plastic postcards, be sure to include a coupon card, gift card, business card or some sort of “punch out” in your campaign. It’s these “punch out” cards that will get your plastic postcards noticed – and more importantly – cause the recipient to react to the offer printed on the punch out card. Our customers have great success with discount cards and with punch cards. Keep in mind, too, that not only do plastic postcards stand out and drive responses; they are also very cost effective. Be sure to chat with our customer service team about the cost saving benefits of a plastic postcard when you start planning your next direct mail campaign. Direct Mail – What are the options for Direct Mail? Direct mail used to be a letter and envelope or an insert in an advertising deck. Times have changed. Direct mail now includes a range of fresh, new products that have proven to drive response rates to new levels. I’ll include a few of the most popular new direct mail options available from My1Stop.com. Plastic postcard mailers are exploding in use. These unique products are about as thick as a credit card, come in standard post card sizes and – best of all – they enable you to include plastic cards as a part of the mailing piece. The plastic postcard mailers we see the most of include gift cards. We see so many of these because the “offer” is ready to “snap out” – providing instant interaction for the recipient – and huge time-to-mail, and overall mailing cost, reductions. These plastic postcard mailers eliminate the need for the mailer (you) to print an envelope, print plastic cards, print a letter, insert the card and letter and drop the letter for mailing – at a pretty heavy postage cost. Instead, plastic postcard mailers combine the letter, the plastic card and the envelope into a single mailing piece. And the entire piece can sometimes be mailed at post card rates. That’s a big wow for most direct mailers. Another trend in direct mail printing is personalization. Again, times have changed. Used to be that personalizing a mailing piece was expensive and the result was a bit odd looking. No more. Post card printing and brochure printing can easily be done with names, numbers, bar codes and even graphics changed on for each mailing piece. Often, the cost for this type of direct mail printing is nominal. If you’re preparing a direct mail campaign, or just trying to learn more, be sure to look into plastic postcard printing and variable data when doing brochure printing and traditional postcard printing. Colorful, custom envelopes are a vibrant and attention-grabbing way of promoting your company. It’s important to remember that certain envelope designs may not be to the United States Postal Service’s (USPS) standards. Be sure that your direct mail campaign, business request, or call-to-action isn’t returned to sender. The design of your custom envelope is important, not only for the image of your company, but also to ensure that your mail piece isn’t returned due to unacceptable color, texture, ink, or shape. While dark or even black envelopes may seem chic or hip, keep in mind that the USPS’ automation process needs contrast to read addresses at high speed. This is why standard envelopes are white or light in color. Additionally, some textured or specialty paper envelopes, those with visible fibers, are not optimal. The fibers can interfere with the mailing address. In addition to the color and the texture of the envelope, the ink color is also important to check. Red ink may look great in person, but it can be a problem when being run through mail automation systems. The same is true with certain metallic inks, so use those with caution. Another consideration for custom envelopes should be given to the type face used. The USPS advises that a sans serif, uppercase typeface that’s 10 to 12 points be used. Some recommended fonts that read well are Helvetica, Arial Black, Courier, and Lucinda Sans. Since you want to attract your customer’s or recipient’s attention with your mail piece, you might consider making it a unique or unusual shape and size. Be careful. An oddly shaped mail piece may not only cost more to design and print, but also may not be something than can be mailed (such as a round postcard) or subject to a surcharge. You can check with the USPS online at www.usps.com for viable products. Remember to check first with the mailing experts before designing your mail piece – it’s best to address any questions you might have before it gets in the mail. My1Stop.com has partnered with Garden Community: Directory over 100 categories to choose from. Garden Zone finder, Giant Garden Directory 100’s of categories to find gardens, specialty nurseries and garden supplies for wholesale and retail trade. Free garden pictures. Copyright free and royalty free pictures. Books, Links to Free Magazines, Articles and more. Can Direct Mail Marketing Really Expand Your Customer Base and Increase Profits? Direct mail marketing has been around since the postage stamp was invented. Tried. True. But sometimes lacking in results – and never inexpensive – until now. Plastic postcards are changing response rates and cutting costs for direct mailers everywhere – and they are easy to add to any direct mail marketing campaign. Direct mail marketing not only can work – but it can work for you in new ways with less cost and greater returns. Adding new solutions like plastic postcards to your direct marketing bag of tricks will keep you on top of the stacks at every mailbox you target. All at a cost – to you and the environment – that’s lower than ever before.